Especially when speaking to an audience it’s tempting to try to put on an authoritative voice, to speak like someone you’ve seen on TV or in a movie. That approach usually comes across as canned or forced and often robotic and soullessly flat. Just be who you really are. 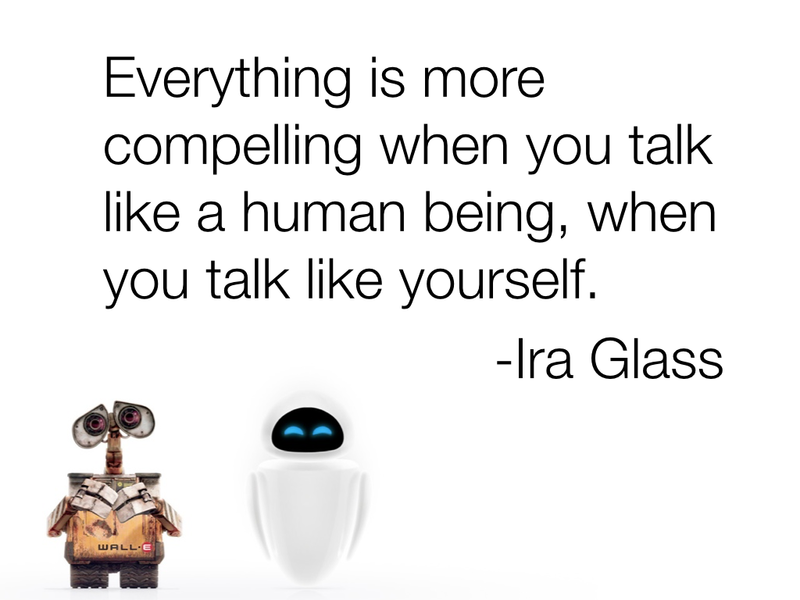 Speak like a human, not like some imagined notion of what someone speaking publicly should sound like. Picture yourself in the audience. Don’t you appreciate a speaker who seems comfortable and authentic and even a little vulnerable? You don’t have to be perfect or fake being perfect. Talk about what you care about and what is true for you and connect with the audience with passion and compassion. Tell stories because that’s what humans do. And have the courage to uncork some emotion as you stand before your fellow humans. We all are leaning in, at least on the inside if not physically, hoping you will awaken something wonderful in us.